Sometimes the best way to bring the Kingdom of Heaven to Richmond, Virginia, is to get out of town. At least, that was the thinking of a few bold women who started “a little camp for city kids” nearly a hundred years ago. The camp has been in continuous operation since it began in 1915. The kerosene lanterns, which shone from the windows of the first cottage, appeared as bright eyes shining through the forest. Thus, the Indian word, “Alkulana,” meaning “bright eyes” became the official camp name. Camp Alkulana is located in Millboro Springs, Va, deep in the Alleghenies. The proximity of the camp to the George Washington National Forest provides it with boundless space and endless program resources. Some of the activities offered during the summer are hiking, cave exploring, camping out, cooking out, rock climbing, rappelling, ropes course, swimming, crafts, Bible study and worship. Though the camp is in Millboro Springs, we consider our ministry in Richmond because we serve the children and youth of Central Virginia. Throughout the year in Alkulana offers ongoing supports in Richmond to its campers through large group gatherings, a mentoring program for older campers, and a targeted leadership program for its junior counselors. 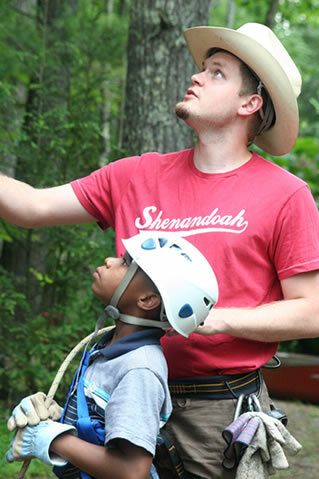 Camp Alkulana’s Mission is to reveal God’s love to low-income and at-risk children and youth of Central Virginia so that they might realize the intrinsic value in themselves and others. Beth told us the story of a girl named Jo-Jo who was afraid to join the other campers in jumping off a rock into the river. The rock was high, and when she looked down she thought, “Uh-uh. I like my life, and I love to live.” She was scared. But everybody else was jumping and splashing into the water and coming up laughing. Finally her counselor yelled, “Scary things make good memories!” And so she did it; she jumped. Every year at First Baptist we take up a special offering for Camp Alkulana. This year, as we continue our year-long, every-member mission trip to bring the Kingdom of Heaven to Richmond, Virginia, you might think of your offering as a way to do that: as a way of getting kids like Jo-Jo out of the city long enough to experience heaven on earth. I’m planning to double my offering this year. I hope you will do the same. How much do I love Richmond? Enough to spend two hours at a school board public hearing last night. 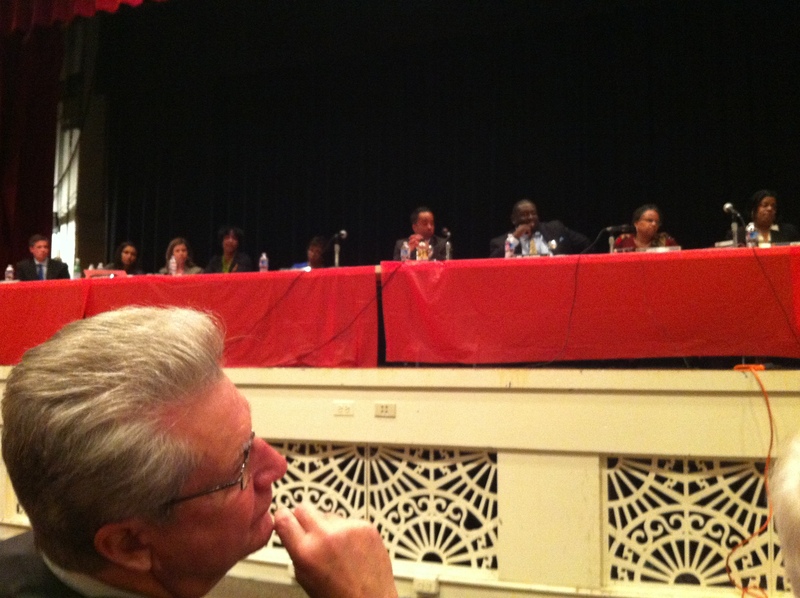 I was invited by a friend who was concerned about the impact of a proposed re-zoning of the school districts. He mentioned something about “re-segregation” and “going backward in time.” But I also got an invitation from Margaret Howlette at Clark Springs Elementary School, where I volunteer as a “lunch buddy.” She was concerned because the proposal would close Clark Springs! (her exclamation point, not mine). I told my daughter Catherine later it was a fine example of the First Amendment in action—the freedom of speech—because everybody who wanted to say something got to say it and the members of the school board just sat there and listened. Some of the things they had to listen to were hard: one woman told them they should be ashamed of themselves for what they were considering; another told them they worked for “the people” and as one of the people she was putting them on notice. Other things were touching, like the second-grade boy in the orange shirt who stood on tiptoe in front of the microphone and said, “Please don’t close my school!” Some of the speakers appealed to the head; others appealed to the heart; some just needed to get something off their chest. What impressed me about the whole process was the idea that in this country you can get a hearing. Those school board members sat there the whole time, and except for calling down someone who booed loudly from the back they did not speak. They listened, or at least appeared to be listening, to every word. Who knows what words stayed with them as they left Thomas Jefferson High School last night? Who knows what thoughts troubled their dreams? I do know this: that as a leader you sometimes make decisions that are unpopular. But I also know this: every word that is spoken—even the most critical one—stays with you. It gets tumbled together with all the other factors in the decision-making process. Sometimes it is that word that makes all the difference in the outcome. I did not speak last night. I listened. That’s how much I love this city. I can only pray that the members of the school board did the same thing, for the same reasons, and that—in the end—they will be led by love and not by anything else. It’s hard to believe that this is how the Kingdom of Heaven will come to Richmond, Virginia, but respectful talking? Respectful listening? That’s always a step in the right direction. Is pride a sin? And is it a sin for a pastor to be proud of his people? If so then you might as well lock me up now because I am guilty, guilty, guilty. 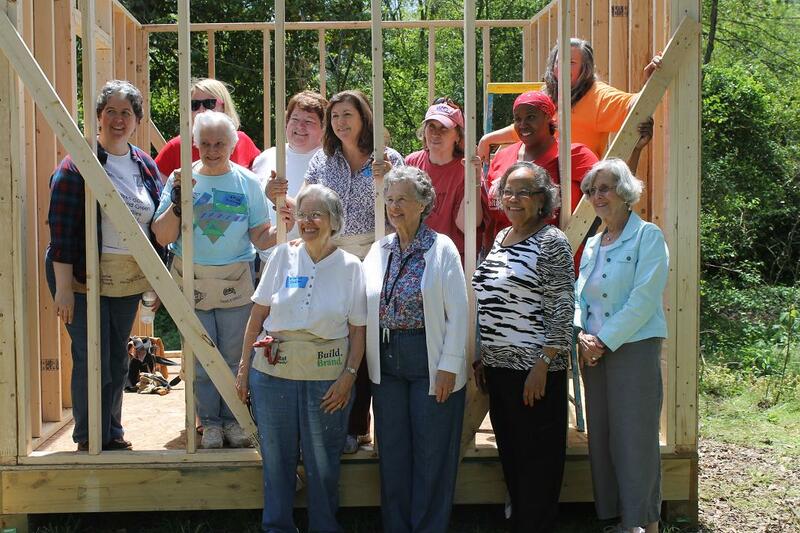 Women Build is Habitat for Humanity’s program for women who want to learn construction skills and build homes and communities. This program brings together women from all walks of life to address the housing crisis facing millions of women and children worldwide. No experience is necessary! On the front row: Eleanor Dodson and “the ladies who brought lunch” (Jeannie Williams, Margaret Payne, and Lu Treadwell). Second row: Mary Ann Delano, Emily Johnson, Resa Hillman, Millie Barnes, Marquita Edmonds (homeowner). Third row: Whitney Guthrie (from Habitat), Liz Southworth, and Lori Bianco. Thank you Bob and Mary. Thank you Jeannie, Margaret, and Lu for bringing lunch. Thank you Whitney from Habitat for being there. And on behalf of Marquita Edmonds, homeowner, thank you Eleanor, Mary Ann, Emily, Resa, Millie, Liz, and Lori for swinging some hammers, driving some nails, and putting God’s love into action. How does the Kingdom of Heaven come to Richmond, Virginia? It’s Memorial Day, and it looks like a beauty. I just stepped out on the front porch to unfurl my flag and everything was so peaceful and sun-drenched—newspapers still on the front porches, absolute quiet on the street. Even now, as I take the first sips of my morning coffee, all I can hear is the birds singing in the back yard. Yesterday I witnessed a Memorial Day moment that really was heaven on earth. Henry Kellam III (a member of First Baptist Church) invited me to his home where his father, a WW II veteran, was about to be reunited with an Army buddy he hadn’t seen since the war. Here’s an excerpt from the story that appeared in this morning’s Richmond Times-Dispatch. 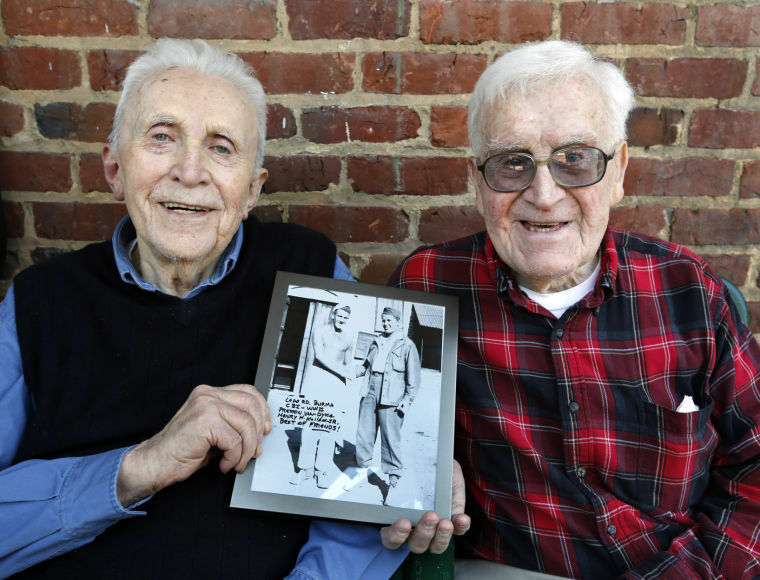 Two old friends saw one another for the first time in 67 years Sunday. In late May 1946, as seasoned veterans of the Burma front in World War II, they said goodbye at a New York train station. The pair had met at Army basic training in 1943 and been together, more or less, throughout the war, working on a road through the Asian jungle. They planned to meet back up, but never did. Over the years, Henry H. Kellam Jr., 88, of Raleigh, N.C., and Preston Van Dyke, 89, of Pompton Lakes, N.J., were in and out of touch. Kellam moved around before settling in Raleigh, where he worked at a Westinghouse plant for 35 years. Van Dyke became a New Jersey mailman. The men’s reunion Sunday was arranged by their families, who recently got in touch with each other. “You should have seen them crying when they first got together,” said Kellam’s son, Henry Kellam III. Van Dyke was already headed to Staunton to meet a 4-month-old grandson, so the Kellams arranged for Henry Kellam Jr. to travel up from Raleigh, and the two men met at the home of Kellam’s son in Richmond’s Fan District. “I just thought it would be a nice thing to do for him,” said Trudi Van Dyke-Simms, Van Dyke’s daughter. 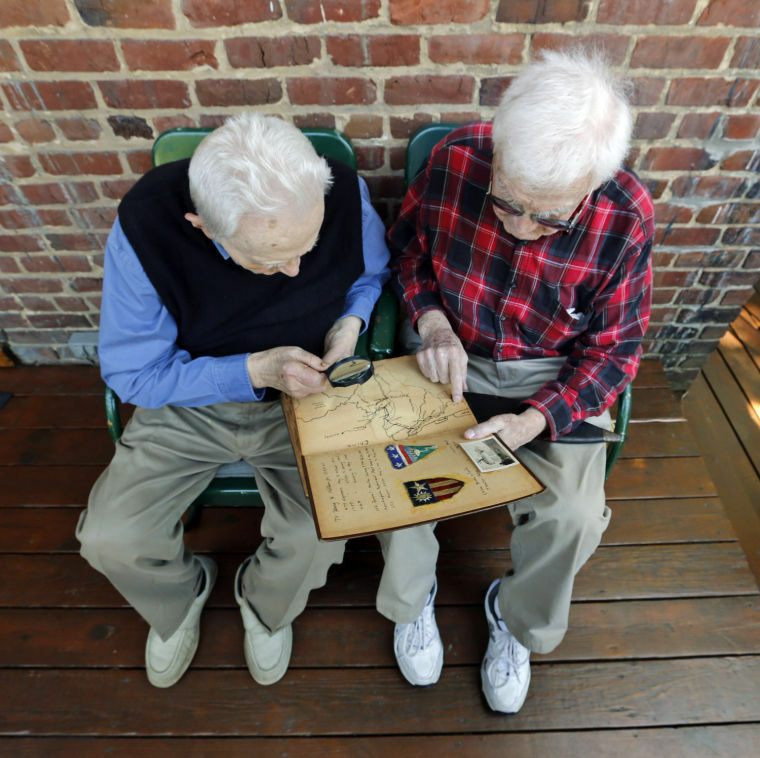 The two veterans sat on a porch, had their photos taken, met each other’s families, swapped stories and looked through Kellam’s old scrapbook. It’s a treasure trove of a book, packed with photos taken with a box Kodak 620: temples, elephants, locals of all stripes, a cremation and suntanned soldiers. Serving with an engineering unit, the two had been shipped across the U.S. and then across the Pacific. 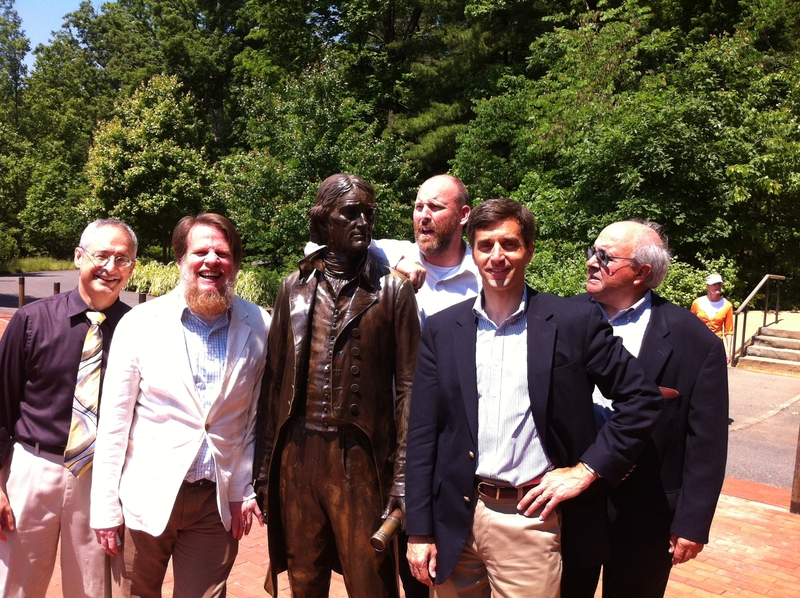 Van Dyke was also with Kellam at the U.S.O. function where Kellam met Thelma Hilbig, his future wife. In Asia, they worked on the Ledo Road, which led from India across Burma to China, a U.S. ally in the fight against Japan. The road was intended to reduce the need for air supply across the Himalayas to Chinese forces. Kellam, who ended his service as a technician fifth grade, is quick to say that he was never in combat. He did maintenance on machinery that was building the road and is modest about his contribution. He recalled volunteering for duty guarding the stockade, because it meant he could get to Calcutta more. He was told to shoot the prisoners if they tried to escape. “I told them I’d shoot them in the leg, maybe,” he recalled. It was truly moving to see these old friends together again for the first time in all these years. When I told them I needed to go Henry III asked if I would say a prayer. I did, and as I recall I said something about how reunions like these rarely occur this side of heaven. But yesterday, this one did. FBC members Tom and Nancy Chewning are bringing the Kingdom of Heaven to Richmond, Virginia, through their love for sports, their love for kids, their love for Christ and a place called U-Turn that brings all three together. This may be the perfect story for Trinity Sunday! Thanks, Tom and Nancy, for all the ways you bring heaven to earth, and thanks David Powers for producing this video. Today is graduation day for the Baptist Theological Seminary at Richmond. 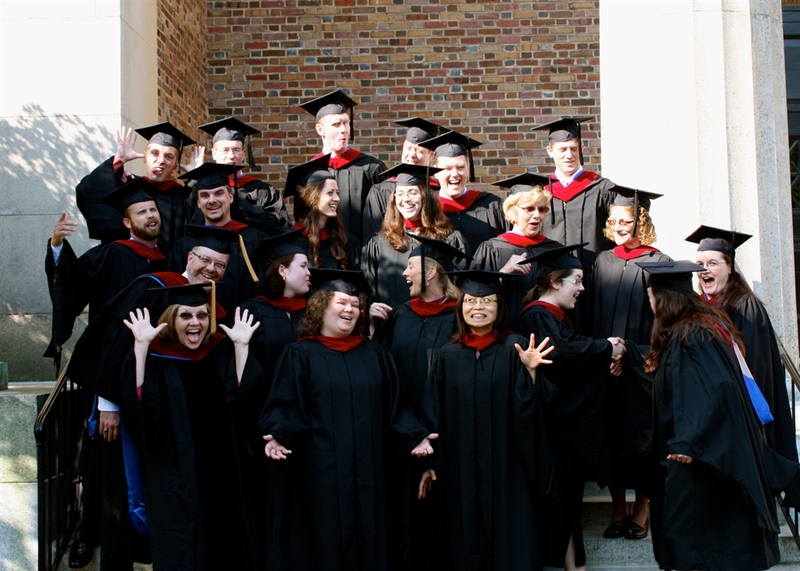 Students who have been working for the last three or four years to acquire the tools of ministry will walk across the stage, shake hands with the president, receive their diplomas, smile for the camera, and then step onto the mission field. It’s a different world than when I graduated 26 years ago. Back then most of the graduates were white men, who would be called as pastors by churches that could afford to pay them a decent salary plus benefits. They might start at a church in a county seat town, but within a few years, if they did well, they could expect to receive a call from a larger church, in a bigger town, with an even better salary. Ministry in those days seemed almost like a reasonable career choice. But today the graduates will include as many women as men, from a number of different ethnicities. Most of them will not have a job offer in hand when they walk across the stage. There aren’t a lot of churches out there that are hiring. And yet you can’t seem to discourage these graduates. I know; I’ve tried. I’m a trustee at the seminary and I’m around the students on a regular basis. I tell them it’s not going to be easy out there, but that only seems to make them more determined. They talk about all the creative ways they are going to engage the world with the gospel, many of which have nothing to do with traditional church ministry. For example: Jay McNeal, who has worked as my intern this year, is planning to keep his job at the seminary library to pay the bills, but work in an unpaid staff position here at First Baptist (donations gladly accepted) to help us develop our Microchurch initiative. We have a dream of starting some 500 small satellite churches in the greater Richmond metropolitan area that would work together with us to bring the KOH2RVA. Jay may be out there week after week helping people organize their microchurches, access the technology, and join the network. It’s something that I couldn’t have dreamed of when I graduated. So, pray for these graduates. It’s not going to be easy for them. But then, Jesus never said it would be easy, not for any of us. “If you want to come after me,” he said, “then deny yourself, take up your cross, and fall in line.” The surprising thing is that these seminary graduates are doing it with smiles on their faces, as if all they ever really wanted out of life was a chance to give it away for Jesus.